1. Use a walking foot. Many people will suggest you use a teflon foot but I don't own one & have had success using my walking foot. 2. Be careful using pins. Pins will leave permanent holes in laminates. 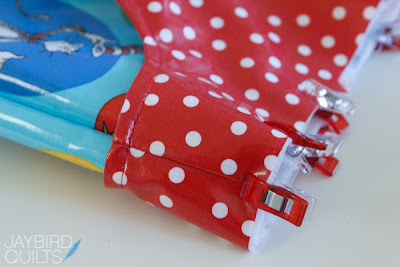 Use pins only in the seam allowance or use clips like I do below. 3. 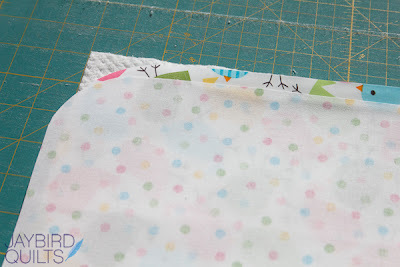 Do not put your iron directly on the laminated side of the fabric or you'll have quite a mess. 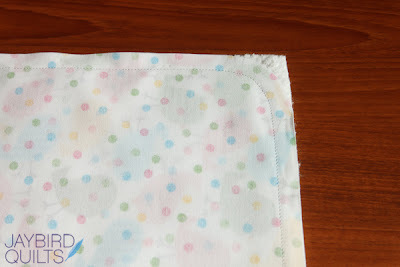 You can press laminates cottons but you need to use a pressing cloth. 4. 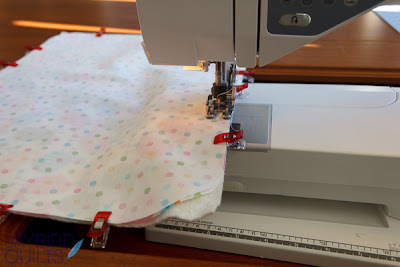 If you are new to sewing with laminated cotton fabrics I highly suggest reading this post by Kathy Mack over at Pink Chalk Studios. Kathy goes over the basics, ironing, washing and sewing tips. 2. Layer the pieces. Start with the batting & then place both pieces of fabric right sides together. 3. 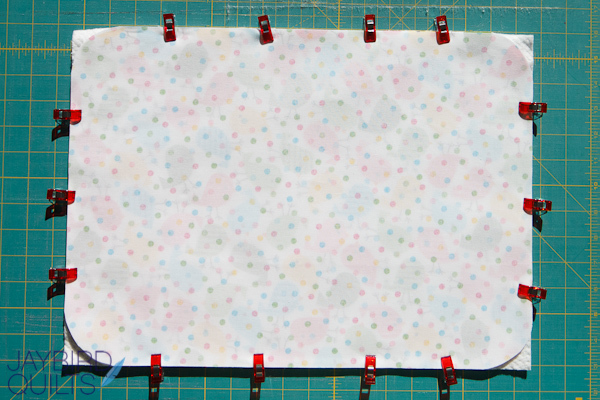 Use the wonder clips to hold all three layers together. 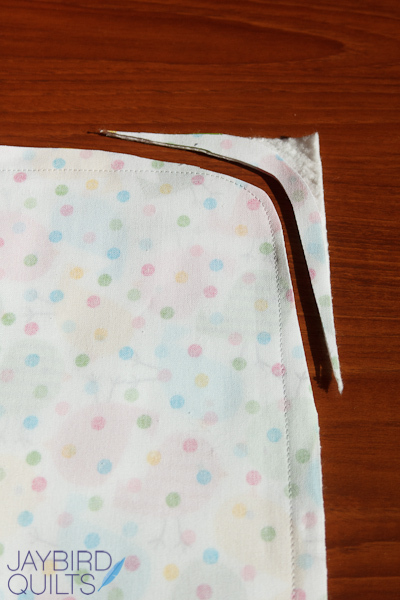 If you are using pins make sure that they are close to the edge in the seam allowance. 4. Use a walking foot and sew around the placemat with a 1/2" seam allowance. 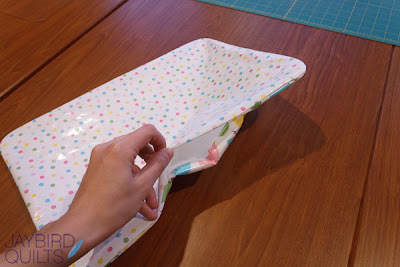 Leave a 5" to 6" opening on one side so that you can turn the placemat right side out. 5. This is what the corners should look like. 6. 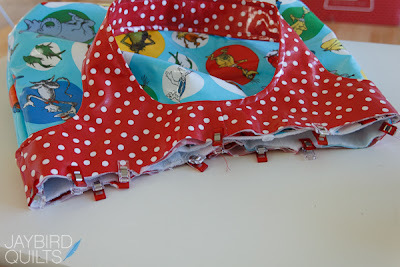 Trim the excess batting and some of the fabric off at each corner. 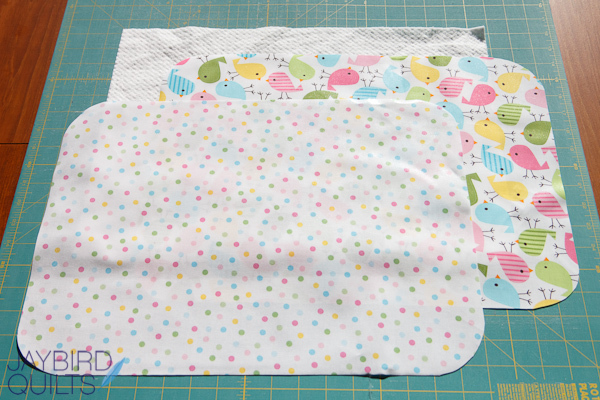 Trim so that you have a scant 1/4" seam at the corners. 7. Turn the placemat right side out. Use a pressing cloth to press it. 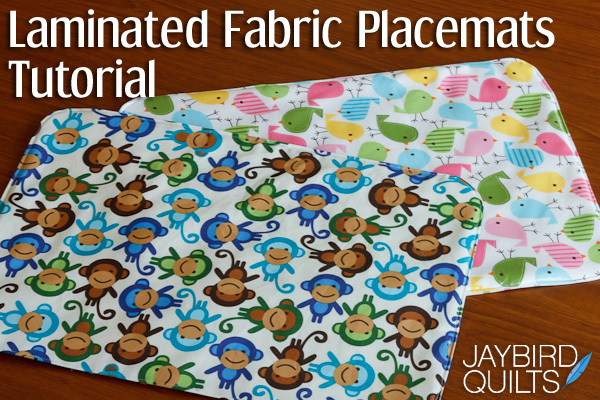 Often the seams will not lay as flat as with regular fabric even after pressing. 9. Use clips to hold the fabric together where the opening is. Start at the opening and top-stitch around the placemat with an 1/8" from the edge. You'll sew the opening closed at the same time. 10. It's that easy! 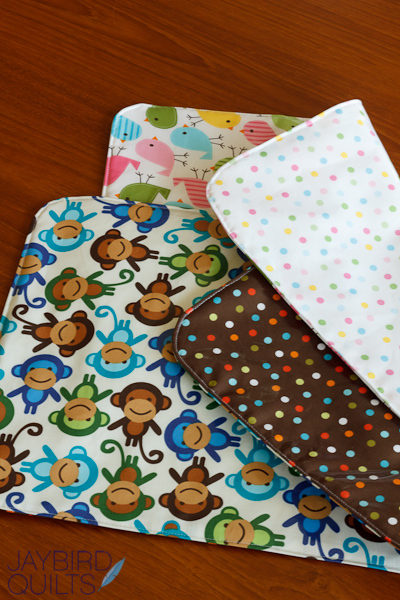 One of the best parts is that these are also reversible. Here are the wonder clips in action when I was making a bag from laminated fabrics. The clips were great for holding all of the layers together. I hope you enjoyed this tutorial! You can find all of my tutorials here. Also if you make these placemats please add a photo to the flickr group so we can all see. I like those snazzy clips you used! I have used paper clips and hair barettes, but I really do need to get clips. Great idea! I looked for those clips last week with my Joanne's coupon and didn't find them of course. With little ones here often too I need to make these soon. YAY! She's back with her fabulous tutes for us. 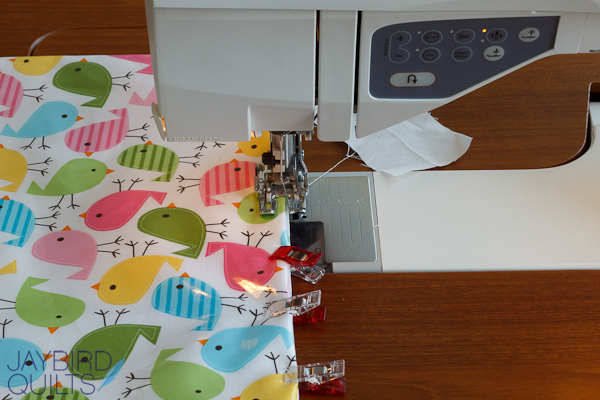 I am so jealous of your awesome sewing table. That looks like it goes on forever in some of those pics. When you showed those wonder clips after you spotted them at one of the shows (possibly Market if I recall) I just HAD to buy some. I quickly learned that the 10 packs are not even close to being enough. I need to buy the larger packs very soon. They are great to use. Love the tutorial. Thank you. thanks for the tutorial!!! 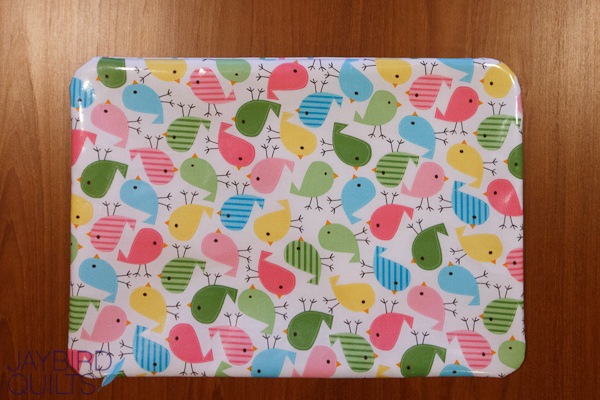 Great idea, and when (or if) you hear what stores are carrying the Urban Zoology laminates, could you post it on your blog so we can get some? THANKS!! Thanks for the tutorial! I have a couple of little people who eat with me and I can imagine that the same technique you showed would also work for a large mat on the floor to catch the food that my little ones drop as they eat. Thanks for the idea. I Pad - vinyl velcro closing - very stylish. Adorable! Great idea for Ann Kelle's fabric. This is a great, zippy tutorial. I've been wanting to make some placemats, but not sure how much time I want to invest...so this a a good reminder of how simple it can be. I purchased some of the Clover clips, just because I thought they were cute. They have come in so handy, and I have used them so many times! I need to buy more. The clips are so cute! I use binder clips (leftovers from my days of being a lawyer) and those work well, but they're nowhere near as cute. I have also heard the it to put scotch tape under your presses foot when sewing with laminates. That has worked well for me, but I really want a Teflon foot or a walking foot!